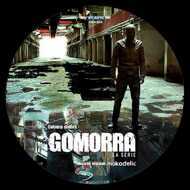 GDM Music is proud to announce the release of the original soundtrack of Gomorra - La serie, the Italian television crime drama inspired by Gomorrah, the all time best-selling book of Roberto Saviano. Gomorrah received unprecedented critical acclaim all over the world. The Guardian (UK) called it “The unmissable, ultimate mafia show” and German magazine Spiegel-Online says, “Forget the Sopranos, here they are the Savastanos!” The music from both seasons of Gomorrah is composed and performed by Mokadelic, a Rome based Psychedelic-Post-Rock collective, specializing in music for film. The music of Mokadelic is influenced by the contemporary sounds of such names as Mogwai, Explosions in the Sky, and Godspeed You Black Emperor, without forgetting the lessons from the great Italian soundtrack composers of the sixties and seventies. An eclectic sound palette that alternates from spacious, melancholic atmospheres to extremely dense climaxes. An emotionally intense musical narrative, deeply inspired by Gomorrah’s haunting realism. The second season of Gomorrah is now on the Sky Atlantic channel.